In a critical reshuffle of the world's archaic political stage, Russia's PM Vladimir Putin and his Chinese counterpart Hu Jintao are looking to lay the first BRICS of a new relationship in Beijing yesterday. From aerospace to nano-development and energy – there is much on the table at this much-hyped meeting. It is significant that this state visit is Vladimir Putin’s first since he announcing his presidential ambitions in the upcoming presidential elections in 2012. This looks like a strong sign that Russia is changing the focus of its foreign policy. For decades – if not centuries – relations with the West have dominated Russia’s foreign policy, but it seems the 21st century is bringing a sea-change with trade winds now blowing from an easterly direction. Doubtless it is China’s economic progress over the last three decades that has made Moscow look to the East with growing interest. Just recently, Russia’s President Dmitry Medvedev said that he was happy with the steadily-consolidated bilateral trade, scientific and technical ties with Russia’s biggest neighbor. The constantly-expanding strategic partnership between one of the world’s biggest and fastest-developing economies – China – and the world’s largest source of energy supplies – Russia – could turn around the power balance of the modern world. Both nations have supported each other throughout the years on issues relating to sovereignty and security, as well as economic and military development. Russia and China’s political views coincide on many issues, as was confirmed at the recent UN Security Council vote on the situation in Syria, when both Beijing and Moscow used their veto to block a harsh, European-drafted resolution which condemned the regime of President Bashar Assad. The resolution suggested that the country could face sanctions if it continued its crackdown on the well-armed, foreign-inspired opposition which has been terrorizing public authorities and the police. Both Russia and China are the backbone of the BRICS alliance, also uniting India, Brazil and South Africa. The continuing uncertainty of the European and American economies has seriously undermined the dominance of the EU and the US on the world’s political stage. The global economic crisis has cleared the way for emerging powers like Russia and China. With Europe struggling for economic survival, Moscow is turning its gaze towards Beijing. Trade between the two countries is expected to top a record-breaking $70 billion this year, making China Russia’s greatest trading partner. Vladimir Putin has stated that by 2020, the Russia-China trade turnover could well reach $200 billion. Prime Minister Putin did not come to China alone. He arrived with a large delegation, which includes Russian business tycoons. In the course of the visit, some US $7 billion worth of deals have been signed. They include agreements spearheaded by Russia’s state investment bank, Vnesheconombank (VEB), which also helped establish the Russian-Chinese Investment Fund (RCIF). Plans to set up a US $3-4 billion investment fund have been announced by the Russian Direct Investment Fund (RDIF) and China Investment Corporation (CIC). The two, together with the VEB, have signed the relevant memorandum of intent. Energy has always been a major priority in bilateral economic affairs between the two countries. The two prime ministers say they have finally resolved all their disagreements related to Russia’s oil supply. The gas talks, however, have been lagging. 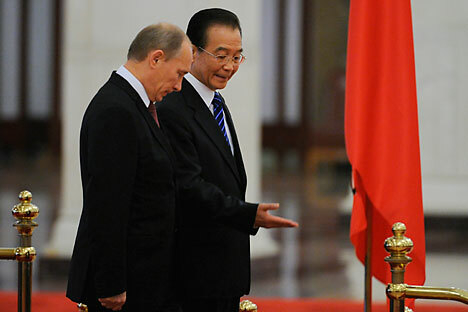 Moscow and Beijing insist they are in the final stage of negotiations, but a binding agreement has yet to be reached. China is expected to benefit from Russia’s leading role in the space industry, nuclear energy and aviation. Russia, on the other hand, is expected to profit from China’s advanced technological and industrial development. This year, Russia and China mark ten years since signing a treaty of good and friendly neighborhood co-operation. Officials from both countries say that relations between the two countries are the best in many years and Vladimir Putin will undoubtedly use his visit to strengthen that.